The movie Cutthroat Island was a box office train wreck, making back only about 16% of what it cost to produce and market. It basically ended Geena Davis’ career, and in general, was a disappointment on all fronts. However, this was the mid 90s, so you were going to see a video game adaptation come hell or high water. The results are exactly as unimpressive as you would expect. Shaw makes sure these British officers get the… *sigh* …point. Like most of the world, I haven’t seen the movie. I can’t say where the game fits in, if it does at all, but it definitely keeps an ongoing story through scrolling text between levels. That story is the most generic pirate tale in history – there are four pieces to a legendary treasure map, and you have one. 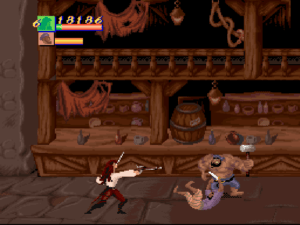 You play as either the infamous female pirate Morgan Adams, or her temporary partner William Shaw, and are out to wrest the other three pieces from their owners. In the later portions of the game, you’ll have assembled the map, made it to mythical Cutthroat Island, and must navigate through inhospitable jungle to claim the booty. At its core, the game is a standard brawler. 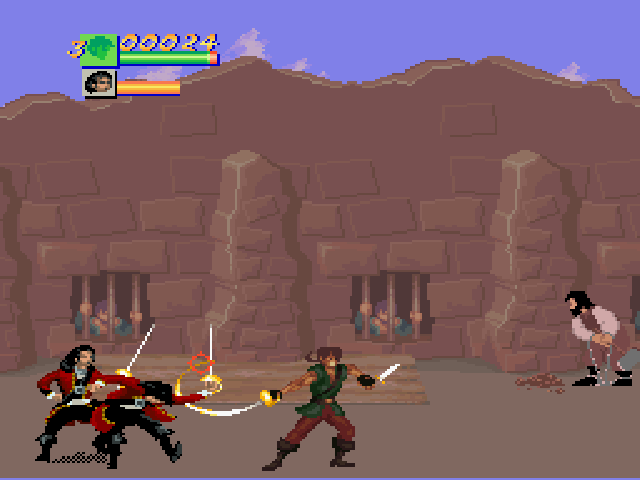 Morgan and Shaw move through simple 2D levels while various pirate types saunter onto screen and throw down. You theoretically have two choices of fighting style at the Options screen – swordplay and brawler. The difference between the two can be defined simply as if you want to win fights, or not. Swordplay benefits from the greater range and damage of the sword both characters carry. If you choose “brawling” instead, you still carry the sword, but your attacks are modified to bash with the hilt instead of using the blade. The idea is that you can string attacks together faster with brawling, but in practice, it just takes too much longer to defeat anyone – especially bosses. The X button slices or bashes, and the Y button controls your off hand. You can cycle between a punch and a pommel smack fairly quickly in brawling mode, but as said, this isn’t as effective as you might expect. Your off hand can also pick up secondary weapons, like a dagger, second sword, flintlock pistol, or explosive cannonball. The Y button deploys them in expected ways. The most interesting feature is how you unlock new moves as you progress through the story. Mashing button combos together will eventually let you spin out a 360-degree attack or stab two swords in opposite directions. Unfortunately, these are the only two new moves you learn, taking most of the impact out of this system altogether. In accordance with 90’s platforming law, there is a vehicle level meant to shake up any monotony. In this case, you’re in a mine cart, careening down hills and dodging trees and rocks. There’s no way to slow the cart down, only steer toward the top or bottom of the screen. Objects come at you too quickly to play a reactionary game, but the sequence isn’t that difficult, just annoying. The positions of each obstacle never changes, so you can (as I did) keep track of a move list to follow when you need to switch lanes. And since it’s just the second level, replaying it a bit at a time is comparatively painless. Put it this way – it could have been a lot worse. A lot worse, like, say, when the game suddenly decides to become a platformer about halfway through. If you make it past the mine cart, the stagecoach level where you have to hop and duck passing flagpoles, and a bit of brawling in between, then you’ll hit Cutthroat Island and immediately have to content with a maze. Caves lead you to new areas of the jungle, and finding the right path through is pure trial-and-error. Meanwhile, camouflaged quicksand pits litter the ground and basically mean instant death. You can run and jump them if you know they’re coming, and pull your ankles out by jamming on the A button, but the intent seems to be to climb vines and hop along broken rope bridges to proceed. This is a fighting engine. Your jumps aren’t powerful enough, and the pixel-precision required for a safe landing is far more difficult that it should be. Forward jump distance is preset, and you cannot control or shorten your jump once in the air. This mean you’ll need to measure out your jump ahead of time, often without clear view of where you’re supposed to land. This makes hopping over relatively simple gaps in a rope bridge unnecessarily fiddly and slow, and of course you’ll die if you miss. This continues throughout the island levels. You’ll need to hop to mossy platforms in order to navigate a cliff face, making some blind jumps along the way (natch). The treasure cave requires you to time your jumps so that you avoid spike traps, while bats flutter around and knock you about when they connect. You’ll really need to be at attention the entire time here, and of course, expect to die and have to restart. As this is the last half of the game, learning where you need to go a bit at a time is a little more annoying that with the second level. Making peace with the flintlock. It’s a short game too, with only 12 levels. They cheat a bit, as some of those levels consisting of only a boss fight, or the mine cart/carriage levels. There is promise though. Levels like the Jamaican town are brilliant – it’s big enough to actually explore, with stores or alleys you can enter and check for extra loot. More levels with this kind of depth would have been great, and the simple fighting levels are actually pretty enjoyable. However, the town level really stands alone. The rest consists of a couple of very linear levels on your boat fighting mutineers, along with the disappointing platform levels on the island. 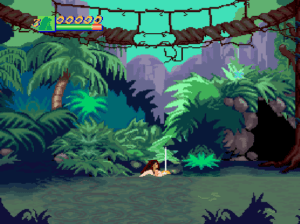 Graphically, the game uses a watercolor style somewhat similar to Another World. It’s certainly colorful, and pretty enough, but also lacking in detail. There’s a pretty decent variety of pirates, with actual differences between enemies like British prison guards and the pirate rabble of “Spittalfield.” Animation is pretty good as well, with the main characters having some great moves and details (like Morgan’s flowing hair). Music is actually pretty excellent, with some jaunty themes and a wide variety of instrumentation. Effects are stock, but do their duty. Cutthroat Island’s fighting engine actually isn’t that bad, and it does an effective job with swordfighting. The off-hand system also adds variety, along with unlocking new moves with progression. I think if it had maintained that focus, it would have been much more fun to play. It’s the weak platforming parts and vehicle levels that bring the game down. To be fair, these may be referencing scenes from the movie, and as such, were pretty much required. But from a strictly gameplay perspective, they take valuable attention away from what works best, in a game that’s pretty light on levels to begin with. Best skipped. Art style is okay, music is pretty great, swordfighting is mostly excellent. If more of the game was as large as the Jamaican town, there’d be more stars up in that score. But do they EVER let you continue from further in the game — do they really expect you to get through the whole thing on 3 lives (plus one-ups) and NO continues? The Super Nintendo is less “Nintendo Hard” than the original NES, but I don’t understand games where you could be playing for an hour or two, then run out of lives and have to start back at the beginning of the whole game (Plok, I’m looking at you here too). Man, at one point of the mid-’90s, I thought that every third game (the kind of Action/Adventue level), on every single port, had a contractual obligation to include an “Indiana Jones and The Temple of Doom”-like mine cart simulator – even if those mechanics weren’t contemplated inside the token film and whatever videogame, whatsoever! Also, in a VHS era, I gave too much to this film, watching it with friends twenty times (not counted…but we’d do the same with “The Pirates of the Carribean”, if we were children now) and, within distance of years, I don’t remember any of those “platformer” sections, in it… well, maybe, when they use ropes to travel from one ship to another, when boarding the enemies’ vessel … So, dammit, let’s blame Disney’s “Mougly”, too! Returning to the game, I think, it’s undertoned: having a potential of an ununusual-and-welcome fighting title, it has been tweaked to become a mish-mash of skill-based minigames, and not that terribly attractivre, starting from the graphics department. I didn’t play it to finish line, but must say that, cut the alienating “platformer” sections, there was too much to think about and to carry around, from level design to game mechanics, for such a hurried budget title.